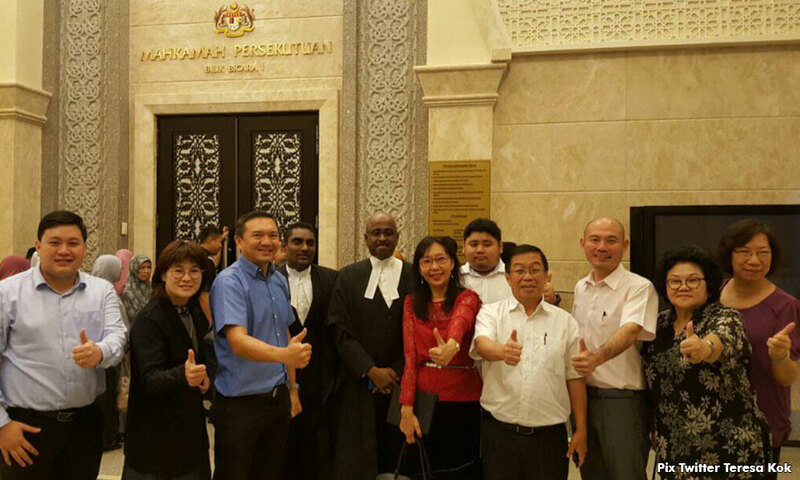 The Federal Court today upheld the decision to award Seputeh MP Teresa Kok damages of RM350,000 for wrongful arrest and detention under the Internal Security Act in 2008. The court dismissed the leave to appeal by the government against the Court of Appeal's decision to award the damages, Bernama reported. The three-member bench headed by Chief Judge of Sabah and Sarawak Richard Malanjum also instructed the government to pay an additional RM10,000 in costs to Kok. The others on the panel were Justices Hasan Lah and Balia Yusof Wahi. The government was applying for leave to appeal the July 26, 2016, Court of Appeal verdict which awarded RM200,000 general damages and RM150,000 aggravated and exemplary damages to the MP. The appellate court had awarded the damages after allowing Kok's appeal on a High Court decision to throw out her lawsuit against former home minister Syed Hamid Albar, former inspector-general of police Musa Hassan, police DSP E Kim Tien and the government over her arrest and detention. It found that the respondents could not provide evidence that there was sufficient reason to arrest Kok. In a 36-page judgment, the Court of Appeal ruled that the authorities are not allowed to threaten or scare anyone except to fulfil specific objectives stated in the law. It also set aside the High Court decision to throw out Kok's lawsuit. In her statement of claim, Kok said she was arrested at her home in OG Heights, Kuala Lumpur at 11.15pm on Sept 12, 2008 and not allowed access to her family or lawyer for two hours. Several hours later at 2am, she was taken to the Wangsa Maju police station and informed that she was arrested under the ISA for allegedly being involved in activities which could lead to racial disharmony or racial riots. Kok denied this and said the arrest had caused her stress and suffering, including food poisoning, and that she was denied her constitutional rights.